I just returned from the Union Square Green Market and I must say I feel a little ripped off. For years I have been enjoying the fresh produce and cheerful conversation of regional farmers at the market but is it me or has the increased popularity (dare I say trendiness) of "buying local" caused the prices to go up and the banter to become largely disinterested? I don't expect the red carpet, and would accept a neutral attitude, but at $12 per QUARTER pound of buckwheat sprouts refraining from acting like I am bothering you would be a nice gesture. (Insert image of apron-clad cashier peering up from her salad as if to say "Can't you see I'm on break" with her eyes). And $2 for a dixie cup of cider? $4 for a handful of completely average raspberries? $1 for a single peach? Really? The gouge-the-drunks-when-they-leave-the-clubs bodega on my corner has better prices. And friendlier service-- I practically had to threaten to put on my "W 2000" t-shirt to get any notice whatsoever. Find the egg vendor on the west side (Wednesday location) for large (presumably) organic free range eggs at $2.50 per half dozen. One of the two people from there is consistently nice, so a better deal than wholefoods and a pleasant experience. The baked goods guy on the west side near the north corner has a vegan (there, I admitted it) carrot raisin muffin I adore for which he charges a very fair $2, smile on the house. At the north west exit today I also noticed some beautiful and mysterious super model cousins of gerber daisies for 50 cents each, generating some disappointment at the mini roses I overpaid for at my usual place as they were a little beat up today and the farmer was not his usual happy self. Keith's Farm can always be counted on for top notch produce at a good value and exceedingly nice staff (wed on the west side, sat on the north side). One of their specialties is garlic, which I don't even particularly care for, and I still go there. Click here for a fuller list of vendors. And remember, no one needs a tomato that badly. If you feel like you have to don controversial apparel to catch someone's attention in order to ask a question or even pay for something, vote with your feet and find a stand you'll look forward to visiting instead. After all, tomato, tomato. On Tues. 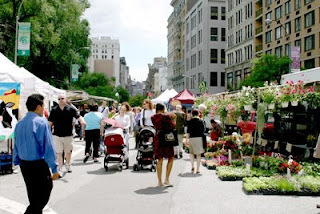 I go to the Greenmarket at Bronx Borough Hall and Sat. at Inwood and I find the prices better at those two than at Union Square. They may not have the variety offered by Union Square, but the vendors are polite and the lettuce is 3 fo $1.00. The corn in the Bronx was 5 for $1.00.